Beautiful lake front home in Chattahoochee Est. West. Large open rooms w/14&apos; ceilings perfect for entertaining. 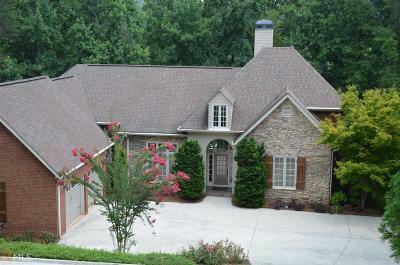 Master has sitting area, 2 walk in closets, separate shower & soaking tub. 2nd and 3rd bdrm/Music room share a bath. Formal dining rm., kitchen w/granite & breakfast area all on main. Lots of windows to take in views of lake & small dock. Expansive covered porch and open deck perfect for grilling. Finished lower level w/large Game room, 4th bdrm & bath, exercise/work out room, workshop & additional storage area. Game rm. opens to lower level deck & backyard cleared to lake.